Nutrition aside, there are other interesting topics worth exploring in the pursuit of health. Can cancer be prevented? Why doesn’t everyone live long, healthy lives? What is the relationship between cardiovascular disease and the immune system? How does the immune system affect overall health? Which is a healthier food option: natural and wholesome plant foods or animal-based foods? How do our lifestyles affect our health? Good health is not a secret. To achieve good health, we must first understand it. 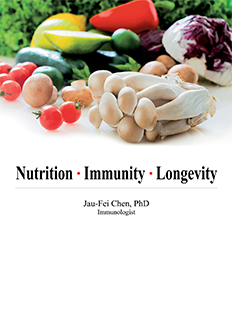 By drawing links between diet, health, and the immune system, this book provides fascinating insights into the preventive science of Nutritional Immunology. Dr. Jau-Fei Chen obtained her PhD in microbiology from Brigham Young University, USA, specializing in immunology and biochemistry along the way. She focused on cancer research for more than 20 years. In 1992, Dr. Chen received the Federation of Overseas Chinese Associations’ Outstanding Overseas Youth Award. In 1993, she was awarded the Annual Model of Overseas Chinese Youth Entrepreneur Award. In 1996, she was named Outstanding Woman of the Year by the Chinese Women’s Association of America. Governor Pete Wilson declared March 8, 1996, to be Jau-Fei Chen Day in the state of California. In 1997, Dr. Chen was named one of the Ten Outstanding Young Americans by the U.S. Junior Chamber of Commerce. She was the first person of Chinese descent to win the TOYA award in that field. She also received the China Dynasty Award in the same year. Through the years, Dr. Chen’s passion for educating about Nutritional Immunology has taken her around the world. She also published many books, including Enjoying Health & Longevity with Nutritional Immunology and Cancer & Nutritional Immunology.